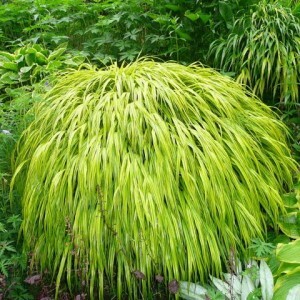 Hakonechloa often can be called as "the crying grass". Such name is caused by that this decorative cereal has the falling leaves. In gardening this cereal started being used rather recently, it and belongs today to the exotic and not too extended at us garden plants. This plant is medium-sized, in height it seldom exceeds 45 cm, and its width varies from 40 to 90 cm. However, adult plants look very attractively, the bushes form volume hummocks curtains.